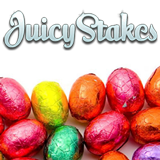 Big tournament weekend this Easter weekend at Juicy Stakes Poker, starting with two added freerolls tonight. There will also be three special GTD tourneys and two Easter Freerolls. So this weekend let’s hunker down with a big basket of chocolate eggs and jujube bunnies and play some tournaments!